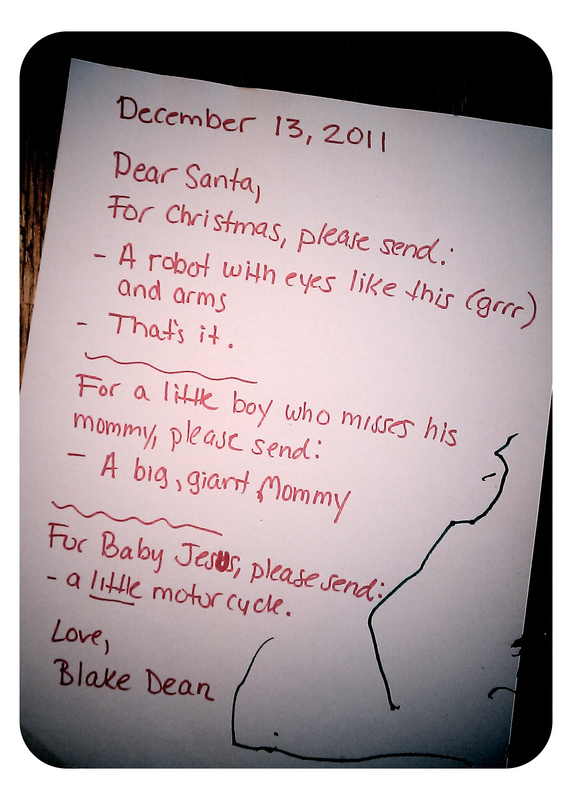 So – inspired by finding the Christmas list my mom saved for me when I was 3, I sat down with Blake Dean this morning to write out our very first letter to Santa. Now – I must say – I’m not a fan of encouraging kids to make huge long lists of things they want, especially when they have everything they could possibly need. 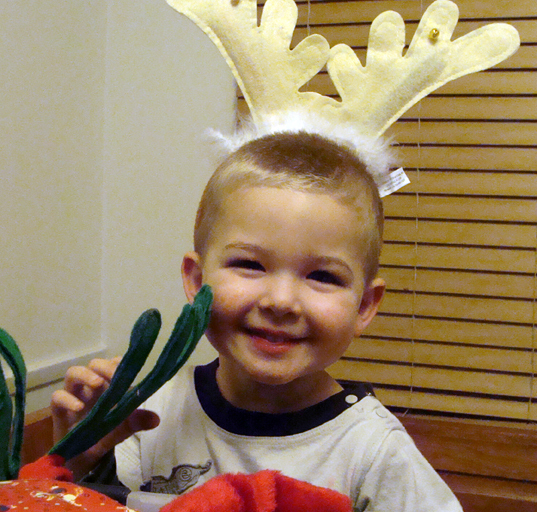 Thus, when the Christmas season came upon us this year, I explained to Blake that good boys get to pick one special present for themselves, and one special present for another little boy or girl. I want him to know from a young age that giving gifts is as fun as getting them, and that it’s important to help those in need. Regardless, today we sat down to make his list, and I was impressed that he did in fact list only one present, even though I asked numerous times if there was anything else he wanted to add. In addition to selecting a present for another boy or girl who misses his mommy (that’s the way Blake refers to kids who are sad/in need), he also decided to ask for one for Baby Jesus, which was sweet. We’ll probably go with letting Blake donate an animal through Heifer International rather than the motorcycle thing … but the thought was definitely there. When I re-read the list to Blake to make sure it was accurate, he told me “grrrr” was not a truly accurate depiction of the sound the robot’s eyes should make. Let’s hope Santa knows what he means. God knows I don’t! Merry Christmas! Wishing all the other parents out there good luck in encouraging the wonder of the season, while also maintaining the reason behind it!